Your chances of attracting audience on online platform are completely dependent on how high you rank on search engine results. Needless to say, when the arena is as vast as a World Wide Web there are going to be illicit practices being incorporated. The first half of the figure points out to the ranks of search engine results minus any rank modifying spamming. However, with rank modifying spamming you can see a great shift in the ranking pages. The websites which rank much lower in result pages climb higher and garner audience for their benefit. Google uses an intricate form of codes for the algorithm it has in place to weed out spam activities. Time and again spammers come with some creative ideas to better SERP rankings. These spam activities only impact the efficiency of a search engine. Over stuffing of keywords is done to make the content look more relevant to the information a user is searching for on search engine. Invisible text refers to the keywords which have same color as that of the background of the page. Invisible text enhances the frequency of the keywords without being visible. Tiny text is the implementation of keywords in very small text within a page. Invisible and Tiny text might even point to a completely irrelevant page which does not carry any information for the benefit of the user. For Page Redirects spammers use a coded first page which redirects a user to completely irrelevant second page. The page automatically redirects the user to the second page only employing a coded page to bluff the Google algorithm. META tag stuffing refers to adding of large set of keywords in the META tags on a page. These keywords generally have got nothing to do with the actual content of the page. The purpose of META tags stuffing works for the reason that spammers are able to attract a large set of audience to the page who probably search with a different set of keywords altogether. What is Rank Modifying Spammer Patent? Consider two documents which are ranked first and second on the search engine results. Now, the second ranked document is a genuine document which is completely relevant to the information a user is trying to search for. However, with all the Rank modifying tricks the spammer has been able to rank his document ahead of the more genuine one. The method analyzes the rankings of both the document. How both the pages are ranked and the difference in accordance with the relevancy of the information searched and provided. Google has clearly laid out the webmaster guidelines for everyone to take note of. This algorithm with it latest modification does it all in real time and accordingly implicates the spammers. Google wants to create a user friendly search engine and accordingly makes changes to its algorithm to make sure that all those spam activities are dealt with productivity. During all this there is a transition where in the result will be completely different from what a spammer can expect. The page which was ranked first with all the spamming tricks either might go down few places or may drastically go down to bottom places. This only invokes a reaction from spammers who might try to get rid of those spam links and in the process invite a Google penalty. A Google penalty might even result in blacklisting of a webpage who indulge in Rank modifying spam tricks time and again along with other illicit activities to rank a page higher on search engine results. 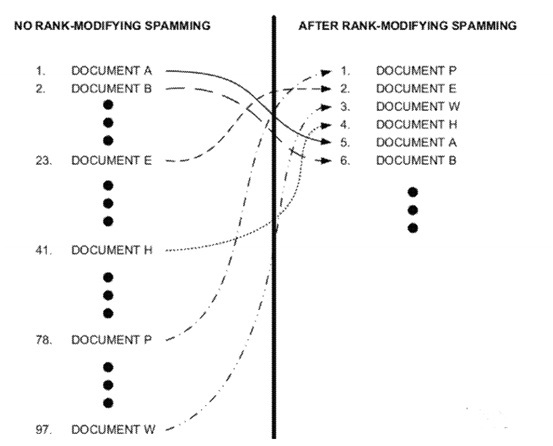 The ranking transition function serves as a highly tool to evaluate rank modifying techniques employed by spammers. It gives confusing reactions to rank modifying spam activities and can impact rankings to a great extent. Google for one makes sure that these spam techniques are detected in nick of time and users are provided with appropriate information.